The NEW JaCkMan micro head blends valve and solid state guitar amplifier technology, resulting in a tiny amp head that can produce an immense sound representative of a classic British amp. At only 163mm x 110mm x 140mm and weighing only 1.2kg the JaCkMan has to fill some giant shoes. It manages to fill them with ease, to have the same mid-gain drive sound that reacts beautifully to you playing and guitar volume. Just like the classic rock monster, the JaCkMan can really sing when you push it further. We say use a TS-type distortion pedal (like the Joyo Green Legend or Vintage Overdrive) to push it into higher gain territory.. This little terror has more rock in it than the whole of Blackpool. (Blackpool is a British Seaside resort famous for its 'rock' of the confectionary kind).. 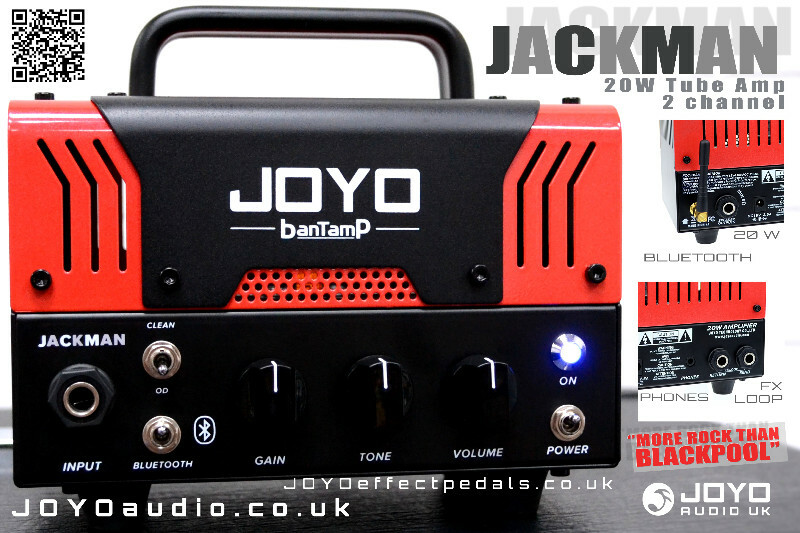 The JOYO Bantamp series are arguably the most feature rich & versatile mini amp heads available at this price in the UK ! The JaCkMan has a 1 x 12AX7 Preamp tube - The ability to reproduce the true sound of your guitar was a key factor in assessing a tube for use with the JOYO Bantamp series. The 12AX7 pre amp tube produces the warm smooth overdrive tones that do not clip tone as a typical fixed state amp head would. The Tube Pre amp has the sonic focus of phattening tone stages and keeps your guitar sounding true to its original tone. With 2 channels flick the Jackman amp to the CLEAN channel and use with your array of guitar pedals. A two channel amp makes a guitar head twice as versatile as alternatives and a makes great companion for musicians at practice or on the road. The JaCkMan will keep it clean and puts everything in place for the drive of your life. The JACKMAN comes alive with its gain settings, you may want to use your favourite overdrive pedals to push it even further into higher gain territory with your own unique flavour. Push the drive and you will hear the JaCkMan scream. You may actually benefit from an additional Noise Gate to control! Pair your Bluetooth device to the JaCkMan and jam along to your favourite classic rock tracks, connect your external device via Bluetooth and play your audio tracks cleanly through the amps Bluetooth receiver channel. We find that this is the great way to practice guitar with and to learn new songs without a big tangle of wires. You can tell them, this is the new JOYO JaCkMan, it's got more ROCK than Blackpool..
JOYO Jackman Demo with Mike Bradley, visit his YouTube Channel for more great guitar vids.